Stop what you are doing! Drop that pen, exit out of that spreadsheet, and stop working on that quarterly report. This is important, Michelin has just announced the new Pilot Road 4 Tires! This news comes as a bit of a surprise to us, considering the relatively short, yet extraordinarily successful product life of the Pilot Road 3s had. Michelin has just announced this tire, so details are sparse until a more thorough reveal early in 2014. What we know so far is that the Michelin Pilot Road 4 tires are going to be offered in three flavors: Pilot Road 4, Road 4 Trail, and Road 4 GT. The standard Road 4s are going to replace the outgoing Pilot Road 3s. 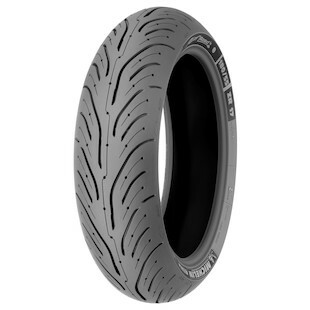 The Michelin Pilot Road 4 Trail are the replacement for the Road 3 Trail, and the new Michelin Pilot Road 4 GT are intended for heavier touring bike applications, and replace the B-Spec Road 3 sizes. If you need proof of how confident Michelin are about these tires, the new Pilot Road 4 GT have been announced as the OEM tire fitment on the new 2014 BMW R1200RT. Just looking at the tires, we see a tread pattern that is very heavily influenced by the Pilot Power 3 tires. The Road 4s feature the same siping technology that debuted on the Road 3s, and incorporate a larger slick surface area towards the shoulder. The siping on the rear tire now runs straight along the circumference of the tire, which should deliver increased stability during upright riding, and the front tires now feature shorter, shallower grooves with more aggressive siping. Michelin is constantly improving the performance of their tires, we expect the new Pilot Road 4s to deliver increased performance and grip. Particular emphasis was placed on improving outright grip and braking performance in the wet. Michelin claims the wet weather braking distance with the Road 4s is shorter than with their main competitors. We also expect to see some changes to the chemical construction of the tire to deliver increased longevity. The sport touring tire competition has been hot on Michelin’s heels ever since the Pilot Road 3s were released. With other manufacturers’ tires getting better and better, Michelin has once again raised the bar in the sport touring tire category. Watch this space for more information as Michelin makes it available in 2014.